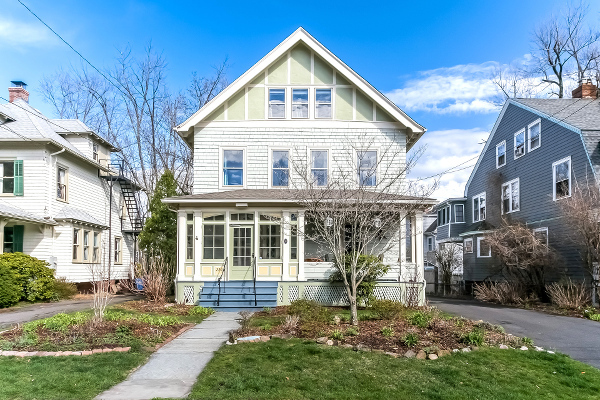 Bright, open and charming describe this cheerful West End Victorian. The home offers fantastic original woodwork with detailing, many built-ins and hardwood floors throughout. A front porch with both open and enclosed seating areas is the perfect place to enjoy the mature perennial garden beds which bloom throughout the spring and summer. Inside, a paneled foyer with bench seat welcomes your guests. The first floor has an open living room with stately fireplace and built-in seat. It opens to a den and the formal dining room with china cabinet. An updated kitchen with eat-in space connects through the butler’s pantry back to the dining room. A powder room completes the first floor. Upstairs, the master bedroom has a full bathroom, two walk-in closets and an adjacent sitting room, which can be used as another bedroom if you prefer. There are two additional bedrooms and the hallway bathroom has been fully updated, including radiant floor heating. The third floor offers two large bedrooms, a full bathroom, and storage space. The backyard has a new paver patio and additional gardens. There is a 1-car detached garage, new driveway, central air conditioning, gas heat and hot water and 200amp electrical service. 220 Oxford is offered at $385,000. If you’d like to see this property, please have your agent arrange a showing or call me at 860-655-2125 to schedule a visit. More details and a photo tour are available.